Since I got my permit back in the spring, on most mornings, I drive to school with my mom in the passenger’s seat. First, I drop my younger brother off at his bus stop, then I’ll drive to my school, pulling into the drop-off lane, then switching places with my mom so I can go to school and she can drive herself to work in Washington D.C. Since I’m passing by two different schools (one where my brother’s bus stop is located, and my own school) I see two different “school zone” speed limit signs, telling me to slow down since I’m in an area where there may be children crossing the streets, unaware of possible risks. These signs, as Lesson #2, Signs, Signals, and Markings, of my online drivers ed course taught me, mean that there is a reduced speed limit when there are children present. 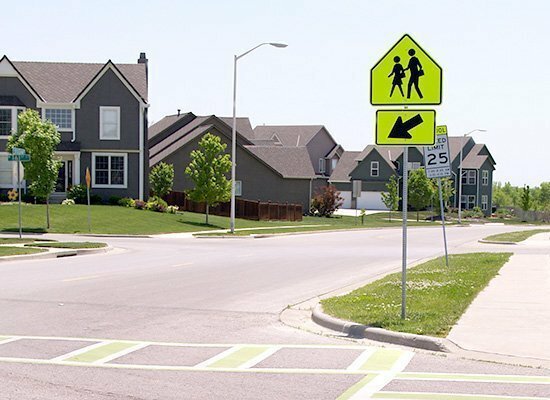 School zone crosswalk: slow down and keep your eyes open! Currently, I’m on the 3rd lesson module of my course–Being Fit To Drive. This lesson, so far, has educated me more on when I should and should not be driving. Two times in the past, I have had panic attacks while driving and pulled over so my mom and I could switch seats and she could drive instead. I’m now realising that while at the time, these actions of deciding not to drive the car seemed like acts of weakness and incapacity, in reality, this is exactly what a good driver should do. It’s crucial that you are in a stable emotional and physical state before you decide to drive a vehicle, as I’m now learning while taking this online course. Before I even learned about how my cell phone can distract me from driving, I would make sure to keep it away from where I could see or hear it, whether that be in my backpack thrown into the backseat somewhere, or in my mom’s pocket in the passenger seat. I know now that this is what I should keep doing, since 21% of teen drivers involved in car accidents are distracted by their cell phones. In order to be a safe, capable driver once I can finally get my driver’s license, I’m going to make sure to not use my cell phone while behind the wheel. I’ll also be sure not to let passengers in the car, loud music from the radio, adjusting my car controls, or anything else distract me from my driving. Lesson #3 teaches me that to be a good driver, you have to be an alert driver. I’d like to think that I’m a pretty good driver right now, but in reality, I still have quite a ways to go in my education as a teenage driver. I hope to finish Lesson #3, Being Fit to Drive, by the end of this coming week! I can hardly wait to further my abilities as a driver, so that I can be more calm and confident behind the wheel.